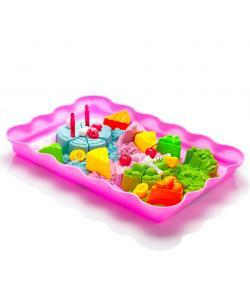 This deluxe playset includes 3 x 300g bags of new Glitter Motion Sand®, 6 cake slice moulds, plastic play tray (colours may vary) and assorted cake decorations. 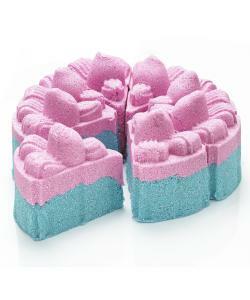 Create a magical glittery cake using the cake slice moulds then decorate the cake with the candles and toppings. 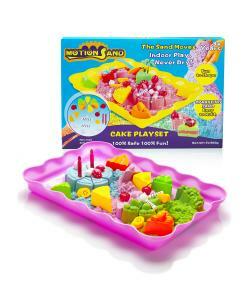 Have endless hours of fun with this deluxe Motion Sand Cake Playset, creating a magical glittery cake with the 3 coloured glitter sands. Use the assorted cake slice moulds to create enough cake slices to make a full cake, then decorate with candles and toppings. Motion Sand® is the squeezable sand where you can FEEL the fun! Pack it, pull it, shape it and love it, Motion Sand is so incredible you can't put it down. It's kinetic - meaning it sticks to itself and not to you! It's easy to shape and mould and flows through your fingers like a slow-moving liquid, but leaves them completely dry. Kinetic Sand stimulates children's creative skills allowing them to create anything they can imagine. It never dries out and is gluten free. 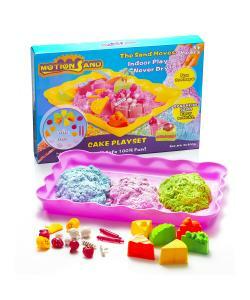 This soft and stretchy sand easily cleans up while delivering non-stop fun! It's squeezable sand you can't put down. The deluxe playtray playset includes 3 x 300g colour glitter Motion Sand® bags, 6 cake slice moulds, plastic play tray and assorted cake toppings. 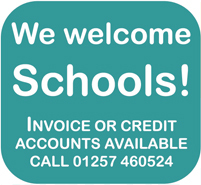 For ges 3 years and over. Motion Sand® is a registered trade mark of ProActive Distribution.